When Clara’s Closet approached me to try out one of their dresses I wasn’t too sure as the thought of running in a dress seemed quite crazy to me and I could never envisage myself doing that. I had a look at their website and the patterns were lovely so I started to warm towards the idea. The dress came very quickly and was wrapped up like a present so I felt all excited to open it. When I did I wasn’t disappointed I loved the feel of the fabric and the pattern – I was still not 100% sure about running in it though. We’ve had some cold and windy weather lately so I waited a while and then last week I decided let’s get it over with and try it out. I loved the fit and feel of the dress. I didn’t want something that was tight and this was nice and loose fitting and dropped comfortably on my hips. Yay for a dress that fits for a woman with curves shape! It was cold so I wore a long sleeved running top underneath which I tucked into my running tights. I think even if it was warm I would wear shirts or tights underneath as I’m not a woman blessed with thighs that don’t join in the middle! 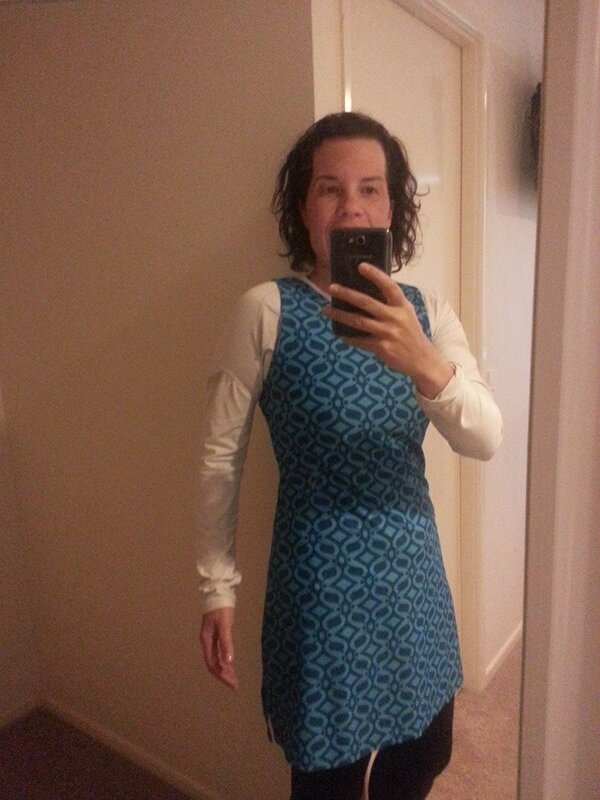 Here we go – me in the dress. Very comfy and I wore tights and a top underneath as it was so cold outside! – excuse my messy hair! I liked as well the fact that the dress was not too short and it would be great as a beach dress too or just to lounge around in. Caroline at Clara’s Closet originally brought the Nuu Muu dresses over from the USA where they are made as she has a love of padding boarding so these dresses are very versatile. So I ventured out of the house in my dress and took to the streets. I have to say it was so comfortable – I loved it. It took a while to get used to the fact that I was running In a dress but I really liked it. I did get a few looks. The street but I’m used to that anyway as people tend to look at runners like you aren’t quite all there. A lot of my non running friends think I’m nuts for running! I genuinely liked the dress and I will definitely continue to wear it and love the versatility of it. It is suitable for cycling, running, yoga, beach, paddle boarding – you name it. Quality fabric and long wearing – value for money and it doesn’t wrinkle! The price is over $100 but most gym gear ie tights are over that these days unless you shop at Target and get what you pay for. The upside is the fabric is hard wearing and I reckon the dress would last for a long time and it’s versatile – and it looks great. If you aren’t a fan of things flapping around then you might not like running in a dress. I wasn’t too sure until I tried it and did find I didn’t even notice I was wearing a dress. 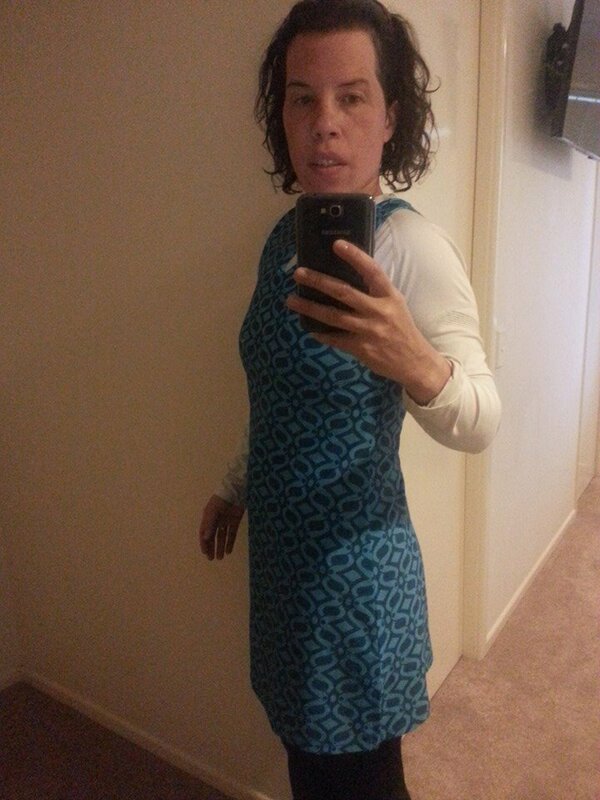 Lovely dress – what size did you get?